Though eight million men died in the Great War, they represented approximately a quarter of the total casualties. Death was far from an uncommon occurrence but a soldier was more likely to be gravely wounded than to die. The men who were plucked from the brink of death were not the same men who had enlisted to defend their country and written hopeful letters back home. Their new reality was drastically altered, and they found themselves in possession of a life they never wanted. Even life-altering injuries – like a missing limb or mustard gas burns – were not the worst of it. Prosthetic arms and legs did exist and burns to the body could be covered. The most unfortunate soldiers had facial disfigurements. Plastic surgery was not very advanced in the 1910s. And it was not a priority, when the doctors were focused on saving lives. A soldier with a serious wound to the face would inevitably have multiple surgeries. Apart from the physical pain that attended these operations, the patients were met with disappointing results. In the hospital wards where men were convalescing, mirrors were banned. “The psychological effect on a man who must go through life, an object of horror to himself as well as to others, is beyond description,” wrote one doctor. Some veterans couldn’t bring themselves to go home at all. Instead, they tried to segregate themselves from the world as much as possible and devoutly wished they had died on the soggy battlefields of Verdun or the Somme. They dreaded seeing family and friends quickly avert their gaze or watching their eyes fill with tears at the sight of them. These men needed and deserved far more than the French government and medical science were able to provide. Anna Coleman Ladd (1878-1939) was an ocean away at the outbreak of World War One. She was a well-known and successful sculptor in Boston when her husband took a job with the American Red Cross in France, perilously close to the front. Within a short time, Ladd also began working with the Red Cross. She founded the Studio for Portrait Masks in Paris, where she and her team created prosthetic masks for soldiers with disfigured faces. The masks were not mass-produced or laser-cut. These masks were individual works of art, created with real care, and customized to hide individual injuries. When a face had been irreparably damaged, the best solution available was typically a rubber mask. 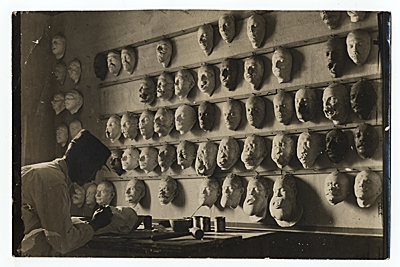 The Studio for Portrait Masks took plaster casts of the injured faces – a horribly uncomfortable process – and fit very thin sheets of copper (1/32 of an inch) over the casts that were then modeled into the masks that looked more natural and life-like. Using photographs of the men that were taken before their injuries, Ladd would try to replicate their features as perfectly as possible, using paint to perfectly match the soldier’s skin. The masks were usually held on with glasses, or behind the ears like a surgeon’s mask. The silent video here was taken in Ladd’s studio. It shows Ladd and her team shaping copper, sculpting, painting the masks – sometimes while having a smoke! – and talking to the soldiers. The man in the video is Francis Derwent Wood (1871-1926), a British sculptor. Wood was also using his talent and knowledge to help fashion masks for disfigured soldiers. There is more information available about Ladd, but both artists produced incredible masks that meant the world to the men for whom they had been created. Anna Coleman Ladd left France after the armistice. Her studio had created over 185 masks that meant the world to the soldiers who wore them. The French do have an unerring sense of beauty and they knew she was beautiful. Seven years before Ladd’s death, she was made a Chevalier of the French Legion of Honor. The title of this post is from A Tale of Two Cities, Charles Dickens’ beautiful book. The novel begins as Dr. Manette, a political prisoner, is released after being incarcerated for 18 years. His imprisonment was unjust and doubly cruel because his family believed he was dead. Unbeknownst to him, his wife soon dies, and their daughter, the very trying Mme. Lucie Manet, grows up believing herself to be an orphan. His imprisonment has completely wrecked Manette, and his brilliant mind has decayed though he has clung to life. His old friend and trusted banker, Mr. Jarvis Lorry, is summoned to France to take charge of the doctor and bring him to England. On the journey to Paris, Lorry imagines a conversation with Manette. The photographs and video in this post are in the public domain. The majority of them were found on the Archives of American Art website. A nice talent to use for the soliders. Their lives must have been so hard but she made it bearable. I do think we all have a talent we can use to make the world better.